In 1908, Louisiana became the first Southern state to select a site for its monument at Vicksburg. Designed by Albert Wieblen, the monument was dedicated October 18, 1920. Situated atop Great Redoubt, the largest, most formidable fort in the Confederate defense line, the monument is a tribute to the forty-one commands of infantry, cavalry, and artillery from Louisiana that served in the defense of Vicksburg. 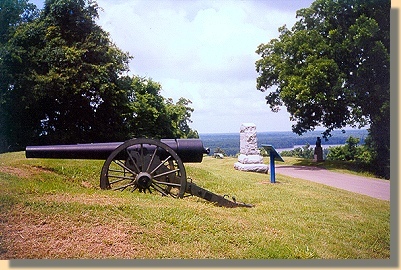 At 397 feet above sea level, the Great Redoubt is the hightest point in the Vicksburg National Military Park. 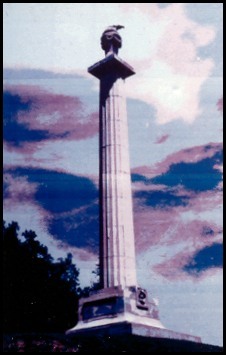 The Louisiana Monument towered over the fort in the form of an eighty-one foot high Doric column topped by a flaming brazier constructed entirely of granite. 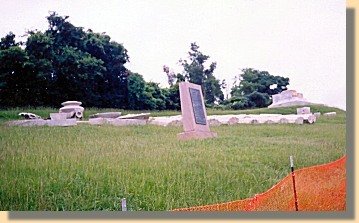 Struck by lightning over Memorial Day weekend 1999, the monument was badly damaged. The column, knocked from its center of gravity, began to shift and posed a serious safety concern to motorists and pedestrians on the tour road. To eliminate this safety hazard and protect the monument from further damage, the decision was made to dismantle the structure. Masons, assisted by heavy equipment, carefully dismantled the column and each piece was marked for identification to enable an exact reconstruction. The National Park Service is currently developing plans for the repair of the monument and hope to soon restore it to its original splendor. Named after its commander, Captain Samuel DeGolyer, who was killed there, Battery DeGolyer was a Union artillery emplacement facing the Confederate Great Redoubt. It contain 22 guns, believed to be the largest concentration of Union cannon at the siege. 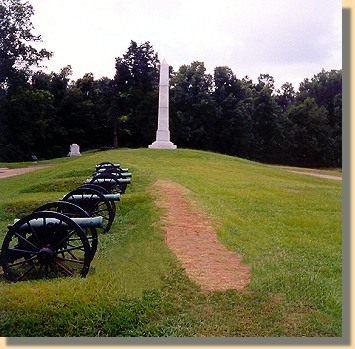 Although this battery bombarded the Confederate position regularly during the siege, the Confederate Great Redoubt did not fall until Vicksburg surrendered, July 4, 1863. At Vicksburg there were many borrowed naval guns manned by army artillerymen. However, at Battery Selfridge the Naval guns there were manned by sailors. The battery was named after Lieutenant Commander Thomas O. Selfridge, Jr., who was its commander. Lieut. Commander Selfridge had been the commander of the ironclad, U.S.S. Cairo, which was sunk by a mine in the Yazoo River in December 1862.